It’s finally festival day and your possessed with excitement. The crew gathers at someone’s house, you call shotgun because you know that’s the VIP seat you deserve. You’re dreading the drive, but that quickly dissipates as the music gets cranked up and the jokes start rolling out. You all reminisce of past festivals and times shared together, you remember why these people are your best friends. You arrive at West Coast Weekender in what seems like five minutes, ready to create new memories to be relived on the car ride home. Check out this article on the different ways you can travel to and from West Coast Weekender with the crew. Weekenders have access to the free Viejas luxury bus! With 10 pick up spots ranging from Mira Mesa to Spring Valley, the spots are spread out across San Diego! Please note that this ride can take up to an hour because of pick up locations, make sure to bring something to drink while you ride. Talking about water… Check out the bus schedule and pick up spots here. Weekend Warriors don’t need to be member of the “MyViejas” rewards program to ride the bus, just show your ID. We do recommend joining it though, you get 20% off food and drinks in the casino and other sick benefits! Weekenders will be able to park in a secured parking structure, for free. Don’t worry about a $20 parking charge or someone messing with your car, they have security watching the parking structure 24 hours a day. 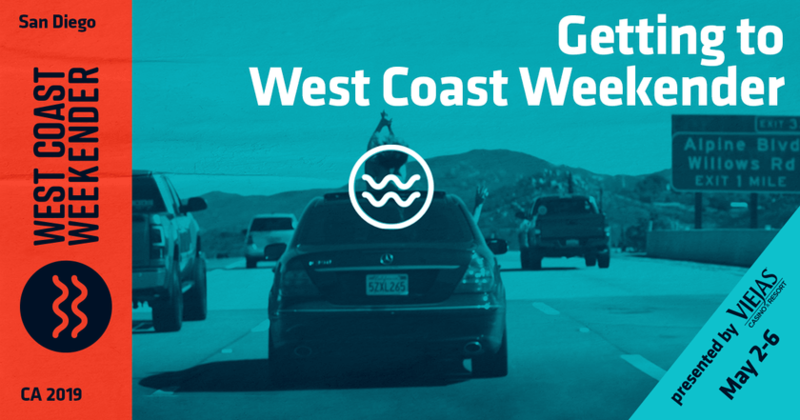 Roll down your windows, hop on the 8 and head east to West Coast Weekender, you’ll be there quicker than you think! You can see Viejas Casino & Resort from the freeway, just take the E Willows Road exit! See the directions here. We recommend taking a rideshare to one of the bus pickup locations and taking the Viejas Bus to Weekender. The buses stop running at around 1:30 am (Depending on your stop) so Lyft will be dispatching extra drivers to get you home in a safe and timely manner! Just kidding don’t do that. You can’t miss the unveiling of our new home with the Weekender style applied. We are rolling out a seriously stacked line up featuring Claptone, Gene Farris, Lee Foss and Purple Disco Machine boosted by a resounding level of production. We also have Roland and Ableton in the house with interactive equipment! Get your crew together and don’t miss this boutique Music Festival experience, no matter how you get here, you’ll be happy you did. Check out this article on the history of West Coast Weekender.